It's not quite as easy as that of course, we are certainly not talking about plastic! 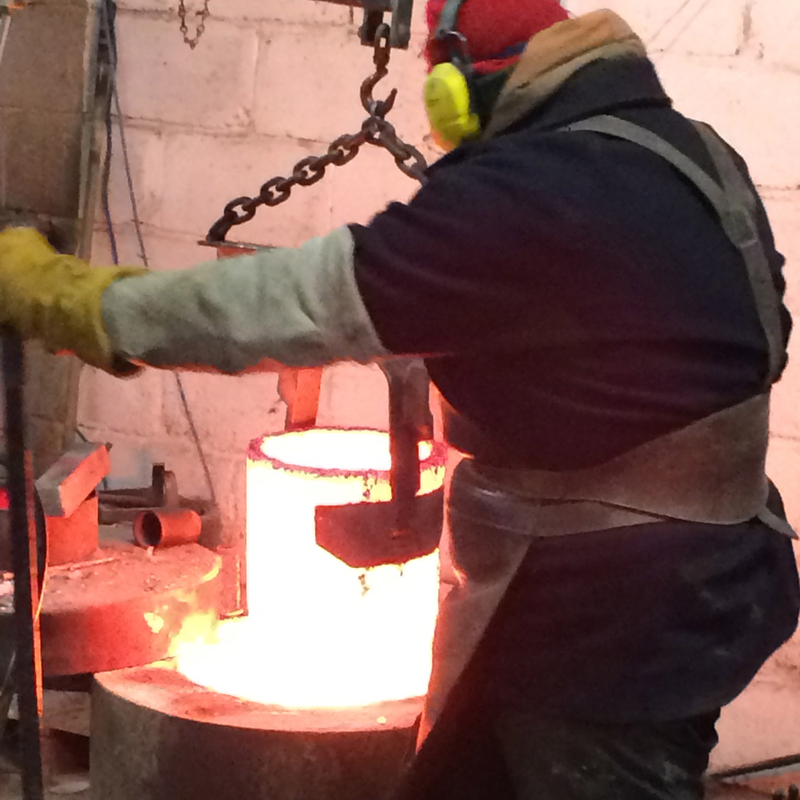 So, here we are are Milwyn Foundry about to pour bronze. In theory it all seems very simple. Pour hot liquid from bucket into moulds. Of course, it appears deceptively simple and there are actually a lot of factors to take on board for the experienced artisan foundry workers when pouring liquid bronze at 1100 C. Paramount is perhaps set up of the moulds. These must be scrupulously clean from any wax residues or carbon on the inside before pouring bronze (not as straightforward as may first appear.) 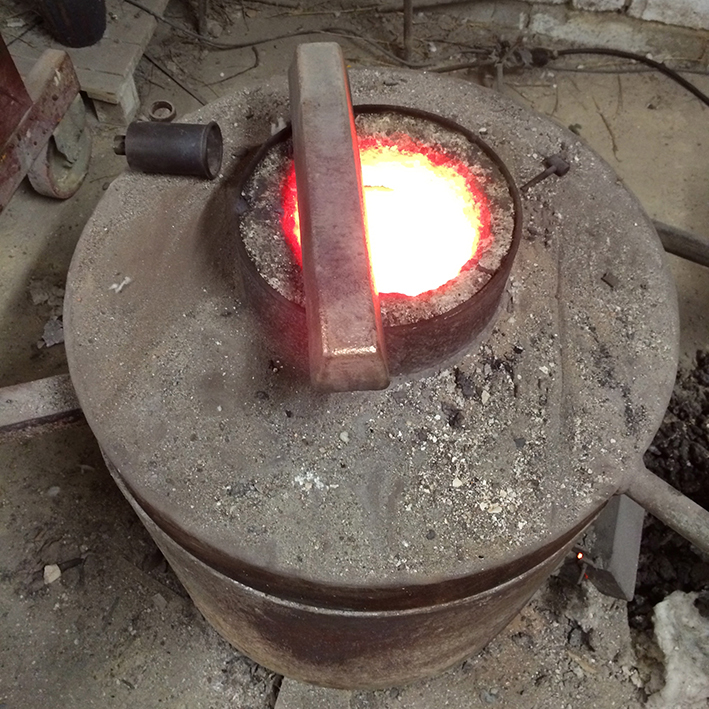 See earlier posts for more about the 'Lost Wax casting process' Pouring temperature and amount of bronze in molten state as well as rate of pour in different size sections are all factors that need to be taken into account. These innocuous looking lumps are actually the moulds for the back sections. The crude looking lumps above look like they should have nothing to do with fine cast mirror polished chairs, however what is visible on the outside is the coarse coating ceramic and wire frame structure that supports the fine inner ceramic mould shell within. The top lump perhaps gives more of a clue to what is to happen as you can see the pour cup and flow tubes that reach to fill the component. The sandbox being loaded with moulds. The sand also helps to support the mould structures when being cast. Furnace. A bronze ingot sits on top. Checking the temperature of the molten bronze with a digital lance pyrometer. A crucial factor. Pouring into the moulds. Note the tin foil covers over pour cups. This is to stop contaminates entering the moulds during filling of sandbox. In the last frame you can see the glowing now solid bronze at the top of the pour cups. And here is one we made earlier! This is the back leg cast component after first stages of clean up. 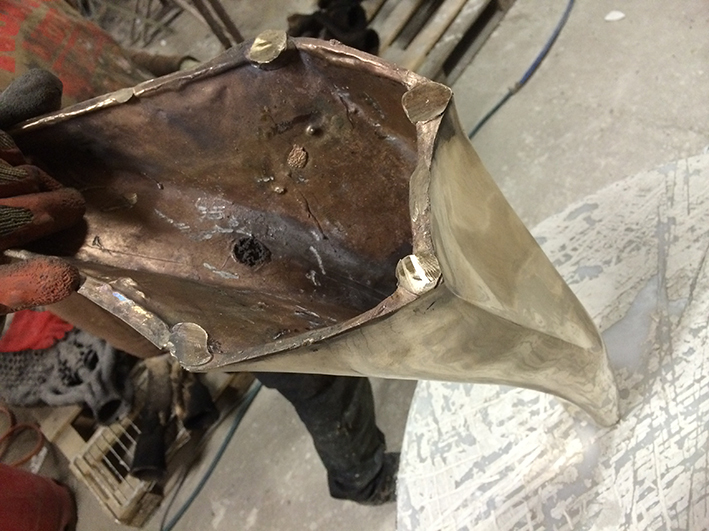 Once all the components have been cast and initial clean up stages towards mirror polished finish, the sections will then be welded together with the same bronze material used from the pour. All welds will then be chased backed and smoothed into a single fluid form before the final mirror polishing stage.